The first season of the historical drama starring Jeremy Irons coming to Blu-ray this December has now been fully detailed. 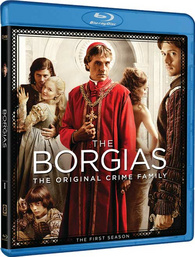 As previously reported, Paramount will be bringing 'The Borgias: The Complete First Season' to Blu-ray on December 27. The 3-disc set featuring all nine episodes of the first season in 1080p video with a DTS-HD Master Audio 5.1 soundtrack and supplements will only include Showtime episodes samplers via BD-live. Ssuggested list price is $65.99.